By redefining the capabilities of a monitor arm, Humanscale created the M8, which combines incredible weight capacity with a stylish, slim profile. Like all Humanscale monitor arms, the M8 allows the user to work in a healthy posture through setting one or multiple monitors at an optimal distance and height, collaborate easier through effortless screen sharing, and increase desk space. Through its fusion of flexibility and strength, the M8 accommodates any single or dual monitor configuration weighing up to 18kg (40 lbs.). 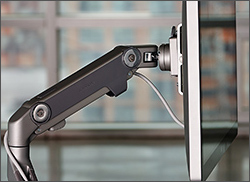 Unlike other high-capacity monitor arms with bulky designs, the M8 offers easy adjustment and flawless ergonomic function in an articulating monitor arm. Thanks to a clever combination of friction axles and an internal counterbalance mechanism, the M8’s robust design easily accommodates heavy monitors while also providing the flexibility to support monitors weighing as little as eight pounds. The M8 is versatile enough to meet the ever-changing demands of today’s workplace. The M8 monitor arm can handle the vast majority of monitors on the market today. With the ability to hold single monitors ranging from 3.5kg to18kg (8 to 40 lbs. ), the M8’s high weight capacity also makes it ideal for supporting dual-monitor applications. Using an optional crossbar support, the M8 accommodates two monitors each weighing up to 9kg (20 lbs.). 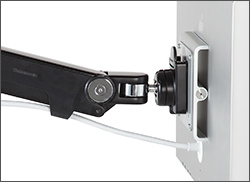 The M8 features considerations like a quick release ball joint for easy monitor installation and removal and an integrated cable management system. It also has a 180-degree stop mechanism that prevents wall damage from over rotation. 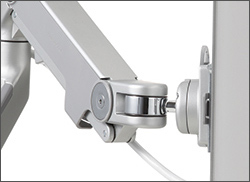 Like all of Humanscale’s monitor arms, the M8 features interchangeable links for additional reach. Customisable add-ons include clamp, bolt-through, universal slatwall, and wall stud mounting options, as well as an optional notebook holder. VESA plates support all monitors with 75mm and 100mm VESA hole patterns. Created by the Humanscale Design Studio, the M8 was built and engineered to offer a high performance monitor arm for any environment. 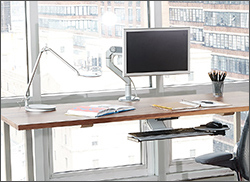 Its ease of use, durability and strength make it the perfect solution for the dynamic, constantly changing workplace.